A transatlantic partnership: UK-based multiinstrumentalistAlan Kelly (ex-Shy) and American vocalist Shawn Pelata (ex-Line Of Fire) have come to release three albums under the name Seven Hard Years (7HY, if you like) 'No Place In Heaven' in 2014 (Lynchburg Music Group) 'Stories We Tell' in 2016 (Lion's Pride Music), and finally, after the addition of fellow multi-instrumentalistand producer Andrew Chick, 'Stories We Tell' in 2017.All three albums were very well-received among rock fans and critics worldwide. The trio of Kelly, Pelata and Chick, teamed once again with Lion's Pride Music, are back with the fourth Seven Hard Years album in March of 2019 entitled 'No Going Back'.Musically, 'No Going Back' shows a significant growth in collaboration among the three members, with Chickcontributing music and arrangement ideas and Pelata,for the first time within the Seven Hard Years mainframe,adding his own lyrical slant. 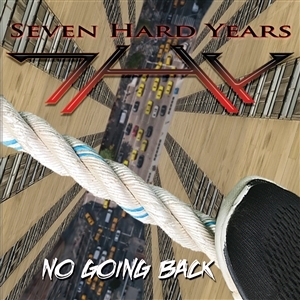 The result is a melodicrecord with strong choruses, big guitars, and a furtheringof what is becoming the classic Seven Hard Years sound.